from my bookshelf: 8. X-Men: Mutant Massacre by Chris Claremont, et al. 8. X-Men: Mutant Massacre by Chris Claremont, et al. Author(s): Chris Claremont, et al. The Marauders - professional mutant assassins, employed by a mysterious evil, with the job of wiping out the entire Morlock community living beneath the streets of Manhattan. And the only hope of salvation the Morlocks have rests in the hands of the X-Men! But can they stop this deadly onslaught? And what do they stand to lose if they should succeed? Collects Uncanny X-Men #210-213, X-Factor #9-11, New Mutants #46, Thor #373-374, Power Pack #27, and Daredevil #238. OK, so I may be a little biased as to the exact worthiness of this book. Way back in the day, on my very first trip to a comic book store ever, I was drawn to a particular comic book that in its own way would change my life forever more. Up to that point, I had been buying comic books, but they were of the decidedly younger variety (and to be honest, I can't even remember entirely what it was that I was reading) but a slightly older friend of mine was going to the big comic book store and thought I should come along. While browsing the shelves, I can upon The Uncanny X-Men #210, and for whatever reason, the group shot of the cast of characters on the cover caught my young eye, and I thought I'd pick it up and give it a try, knowing really nothing about what I was buying. I got the issue home, and after reading the other, "younger" issues that I had picked up that day, turned my attention to the X-Men title. I opened that front cover, and what was this? Somebody was being killed on the first page spread? They did that in comic books? Quite frankly, at that young age, somehow this was totally shocking to me. Needless to say, I devoured the entire issue, and begged my mother to drive me around to the local 7-11 to see if they had any other issues of the series on the shelves. And what was more, the story that was being started in issue #210, the Mutant Massacre, tied directly into other series, so that I had to pick those up, too, to get the entire story, thus introducing me to a huge cast of characters that I've been following over 20 years later. Up to that point, I had really taken comics for what they were; entirely juvenile fluff that had no literary value whatsoever. And some may still argue that point with me, that comics carry no literary value at all. In some cases, I can agree, but as a whole, I think comics have come into their own in the last decade or so and you can find some arguably fantastic stories in comics. For me, The Uncanny X-Men #210 was an eye opening experience; here were characters who were real, had real emotions, fought not only against their cast of villains but also amongst themselves, and had to strive to find their place in a society that didn't necessarily accept them. In the Marvel Universe, especially in the 80s, mutants were seen as something less than a real person and they were the subject of prejudice. These social overtones are still going on in the comics today, and these are social tendencies that are still seen in the real world today against certain segments of society, so these parallels to real world troubles were amazing to me at that age. If I remember correctly, this storyline was also one of the first of its kind, running through so many issues and titles, all having to be read in order to get the full scope of the story. Not that there hadn't been crossovers in titles before, but I think this is one of the ones that really started the trend through the late 80s, at least for Marvel's mutant titles. Anyway, now that my personal back story about comics is over, I can say that even after 20+ years, X-Men: Mutant Massacre can still stand on its own as a decent story. Of course, it's severely dated in some circumstances, but if you can read it in the context for when it was written, where characters needed to be called by name in every issue to make sure the readers knew who they were, and the fashions that the characters were drawn in are so the 80s, if you can get passed all that to the actual story, it really isn't all that bad. The Marauders, a mysterious group of mutant bounty hunters, have been hired to find the Morlocks, a group of mutants who have decided to remove themselves from society altogether and live in tunnels under NYC, and exterminate them, entirely. Why the Marauders were hired for this purpose is never entirely made clear and who hired them remains a mystery, mentioned only once by the name of Mr. Sinister (all this is explained many, many years later and even I don't know the entire reasoning behind it), but in the course of this massacre, the X-Men are contacted to help the Morlocks, and a war breaks out between the Marauders and the X-Men, with several other super groups being brought into the mix. There are casualties on both sides, some with ramifications that had to be dealt with for years for the characters. The art is amazing in this volume, also giving me my first experience with some of the artists that would become some of my favorites over the years, such as John Romita Jr and Alan Davis. There was a good portion of my childhood that was taken up with ideas of being a comic book artist because of these guys. Alas, that never happened, but I can still appreciate their art on these issues all these years later. This newly released hardcover edition is presented quite nicely, with all of the relevant issues presented in chronological, reading order. 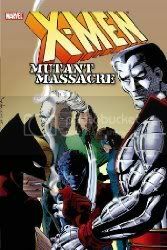 X-Men: Mutant Massacre certainly won't be for everybody, but I think if you are a current fan of the X-Men titles and you've not read back this far in the X-Men canon, I think it would be a good idea to see some of the defining moments for these characters, as quite a bit of the characters that we see today came from the events of this one storyline. Of course, that could just be me, since I've already confessed to being a little biased toward this story. But I'll still stick by it no matter what.